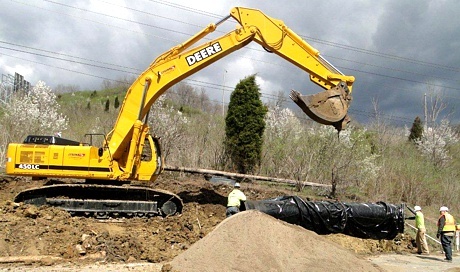 Since 1984, Lykins Contracting, Inc. has been serving the tri-state area, and beyond, in the underground utility and excavation fields of the construction industry. Lykins specializes in the following areas, water main, sanitary sewer, storm sewer, horizontal boring, directional drilling, site excavation, and manhole rehabilitation. Lykins is your single source solution for completing all of your underground and site utility work. We proudly serve the Municipal, Commercial, and Private Sectors. Our vast experience allows us to successfully complete the simple project as well as the most complex, on time and within budget to meet our client's goals. Copyright 2019 Lykins Contracting, Inc.. All rights reserved.